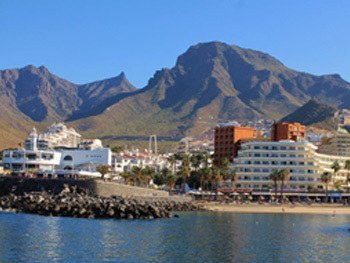 Tenerife is a perennial favourite amongst our students, as the temperatures usually hover between 20 and 30˚C, making it an excellent location in which to learn Spanish, whatever the time of year! 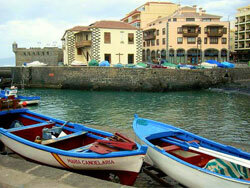 The island has a rich and varied history, having only come under Spanish control in the 15th Century. Many locals emigrated to Latin America, meaning that the accent here is the closest in Spain to those of Latin America, and the islanders continue have retained their strong ties with their cousins across the Atlantic. 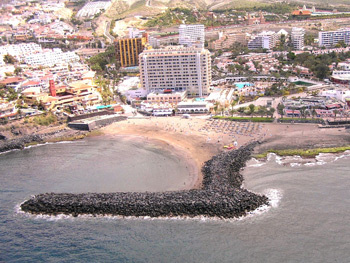 Costa Adeje is located in the island’s southwest, nestled between the vibrant resorts of Playa de las Americas and Los Cristianos. Whilst the area is popular amongst tourists, Costa Adeje is a more sophisticated resort, offering excellent shopping and plenty of refined, waterfront restaurants. 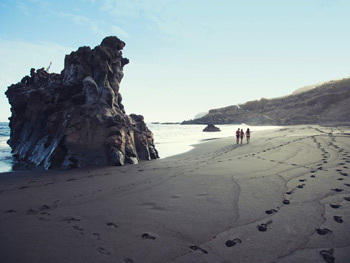 Whether you wish to spend your time relaxing on the beach or prefer to be more active, Costa Adeje offers something for you. 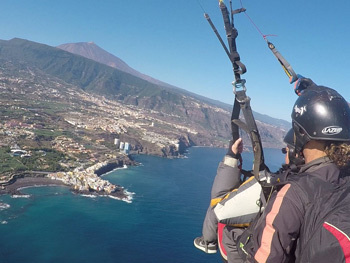 From tranquil, golden sands to dramatic, volcanic beaches and from excellent golfing to a wide range of water-sports, Costa Adeje really is much more than just another beach resort. 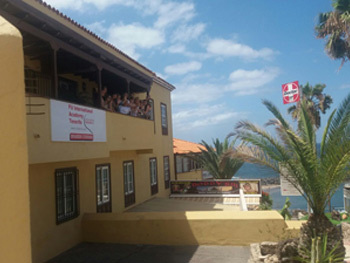 Our Spanish school in Costa Adeje is just a few steps from the golden sands of Playa del Bobo and offers stunning sea views from the school terrace, which is a fantastic place to have coffee with your fellow students in between lessons! This is a small, friendly school, with 5 bright and fully air-conditioned classrooms. The school also offers wireless Internet access throughout. Close to the school is not only the beach, but also some fantastic shops, bars and restaurants. Your teachers will all be native Spanish-speakers, who are educated to a university level and are experienced in teaching Spanish to international students of all levels. Group courses, such as the ‘Intensive’ course of 20 lessons per week and the ‘Super-Intensive’ course of 30 lessons per week, tend to be the most popular choices of course, as they focus on improving students’ overall level of the language. A level test at the beginning of the course will help to ensure that you are placed in the correct group with students of a similar level. The only difference between the ‘Intensive’ and ‘Super-Intensive’ course is the number of lessons per week. If there is a particular aspect of the language on which you wish to focus, then you may like to consider the ‘Intensive + Private Lessons’ course. The additional 5 private lessons really can be used to focus on whatever will be most useful to you. Alternatively, make the most of your time in this stunning location with some surfing or diving lessons! Spanish lessons take place every day from Monday to Friday and you will have weekends free to explore the island or relax and enjoy this idyllic location. If you would also like us to arrange your accommodation, you can choose between self-catered shared apartment accommodation and host family accommodation on a bed and breakfast, half or full board basis. Shared apartments are generally comfortable but basic, so do tend to be most popular amongst students in their twenties. The shared apartments offered by our school in Costa Adeje are normally located in one complex, which is located about ten minutes from the school. Each apartment consists of three single bedrooms, as well as a communal kitchen, living room and bathroom and the complex also benefits from a swimming pool. There are supermarkets close by where you can purchase food, or if you do not feel like cooking, there are plenty of cafes and restaurants close by! 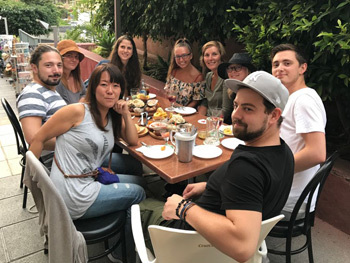 Host family accommodation will allow you to connect with the local way of life and practice speaking Spanish with native speakers on an everyday basis, so this is always our recommendation. You can choose to be accommodated on a bed and breakfast, half or full board basis. You will have your own room and will share the bathroom and general living area with your hosts. Please note that you will not normally be permitted to use the kitchen to prepare your own meals. Host families can be located in different areas, so the school may be up to 30 minutes away. Our colleagues at the school know the host families very well and visit them regularly to ensure that they are able to offer suitable accommodation for students. 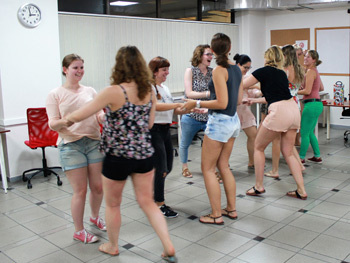 Our colleagues at the school offer regular activities, to ensure that you get to experience island life, meet your fellow students and, of course, practice your Spanish outside of the classroom! The activities offered will vary from week to week and, as they are completely optional, they do usually incur a small additional charge payable directly to the school to cover costs. 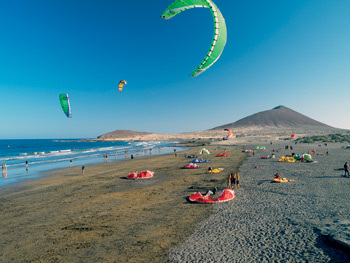 Examples of typical activities arranged include tapas evenings, salsa lessons at the school, beach volleyball and water-sports such as scuba-diving, paragliding and surfing. 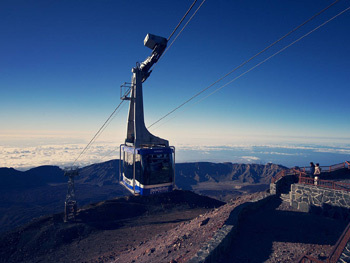 Fly into Tenerife South Airport and take the number 111 bus to Costa Adeje. Alternatively, we would be pleased to arrange an airport transfer for you for an additional charge. Average score for our school in Tenerife - Costa Adeje based on 13 previous client reviews. I really enjoy the course. The teachers are great. We did lots of activities for learn for example every Friday we speak Spanish over a coffee and we apply what we learned during the week. This is a different way to learn. In addition to all activity during the week. I really enjoy theses 2 months. And I learned a lot. Fantastic course, friendly staff and students. Excellent accomodation, truly five star. The techers that I had were wery good and very helpful if you had some kind of a problem. The accomodation was good. I learned to understand the grammer of the spanish language. this is verry helpfull and I am thinking to sign up for a next course. I like to thank the teachers in costa adeje for their patience and kind and relaxing way of teaching. 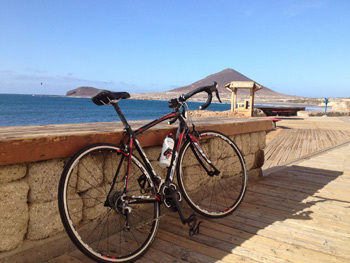 I am sure I will sign up for a following-up course in costa adeje Tenerife. Tutors excellent. Started course as an absolute beginner, they took you through everything thoroughly and competently. The accommodation was fine, large, clean but a little far from the main restaurants.